Best Harness For Small Dogs Review: Top-5 in April 2019! A dog harness is an essential piece of accessory for walking or running your pet. It serves the purpose of restraining or training a dog and comes in different varieties in terms of size, shape and materials it is made from. There are different styles of harnesses from front-clip, back-clip, step-in and so on all of which serve different purposes and have their specific benefits and shortcomings. Like almost every other dog care accessories, size is of major importance when picking a harness. For owners have of small dog breeds or small pups, finding a good and comfortable small dog harness requires a lot of research. We have compiled some of the best options you will find in the market as a guide to finding the best harness for your small dog. Harnesses come in different sizes and finding the perfect one starts with choosing the right size for your dog. But size is just one of the many other factors you have to put into consideration. The best small dog harness must fulfil different criteria that ensure the safety and comfort of your dog. Here is a review of some of the best options you can buy for your small dog. The Easy Walk Harness from PetSafe is a comfortable dog harness that provides a snug easy fit for your pet making walking more comfortable for your dog and more convenient for you. This dog harness is designed to solve one of the most prominent problems of walking your dog; it is designed to discourage your dog from pulling as much as possible without putting pressure on your pooch’s throat and does not put your dog at risk of choking. The easy walk harness is designed to discourage opposition reflex in your canine. Unlike what you get with a regular dog harness, PetSafe Easy Walk has a front leash attachment which helps to discourage leash pulling by gently steering your pet to your side. It also puts your dog at a reduced risk of choking since it rests along your dog’s belly and chest and not on its throat. This dog harness is easy to wear for you as well; it comes with belly straps that have complimentary colours making it quite easy to figure out which of the straps go on top and which one stays at the bottom. It also has four points for east adjustment until you achieve a perfect fit for your dog. Choosing the right size for this Harness is based on the measurement of your dog’s chest and not based on weight. Thus you should measure your pet’s girth with a measuring tape first before setting out to pick a corresponding size. The area to measure is the chest area just behind your dog’s front legs. What size is suitable for a ten-pound mini poodle? Picking the right size is based on your dog’s girth and not its weight. Measure the girth of your poodle and compare to the manufacturer guidelines to be sure. The Dotty harness comes in vivid colours and has dotted patterns that you will love. It is designed to be as comfortable as possible for your dog. This is aided by an inner filler for added comfort and adjustable chest belt for a more convenient fit making it a suitable small dog harness for your little pooch. This harness is designed with the small dog in mind and comes in sizes specifically suited for walking small dogs. It is an over-the-head harness and comes with a chest belt that makes it possible to adjust the belt for a more comfortable and snug fit. It is available in black, pink and sky blue colour and is varying sizes as well. Note that the Puppia Dotty Harness is designed specifically for small and medium-sized dogs. Therefore larger sizes do not directly translate into larger dogs breeds. Measurement for this dog harness should be taken around the base of the neck. You should also measure the chest girth behind the front legs and take into consideration your dog’s head since it is an over the head harness. All the sizes of Puppia products are standardized and based on the chest girth you can visit the Puppia website to see the comprehensive chart. Designed for the optimum comfort of medium breed dogs this dog harness is recommended for walking dog breeds like Jack Russells, Toy Poodles, Cairn Terriers, and similar breeds. It is designed with non-pulling mesh which helps to maintain total control while and safety without compromising on the optimum comfort of your dog. This dog harness is made from premium quality nylon mesh which is nickel plated making it a sturdy and durable option for your dog. It is suitable for medium breed dogs and can fit dogs with 8 to 10 inches neck size and measuring approximately 2-8 pounds in weight. It comes with a no-pull mesh with an elastic webbing which allows it to stretch laterally to accommodate your dog’s movement while preserving control as much as possible and maintaining maximum comfort for your dog without choking. 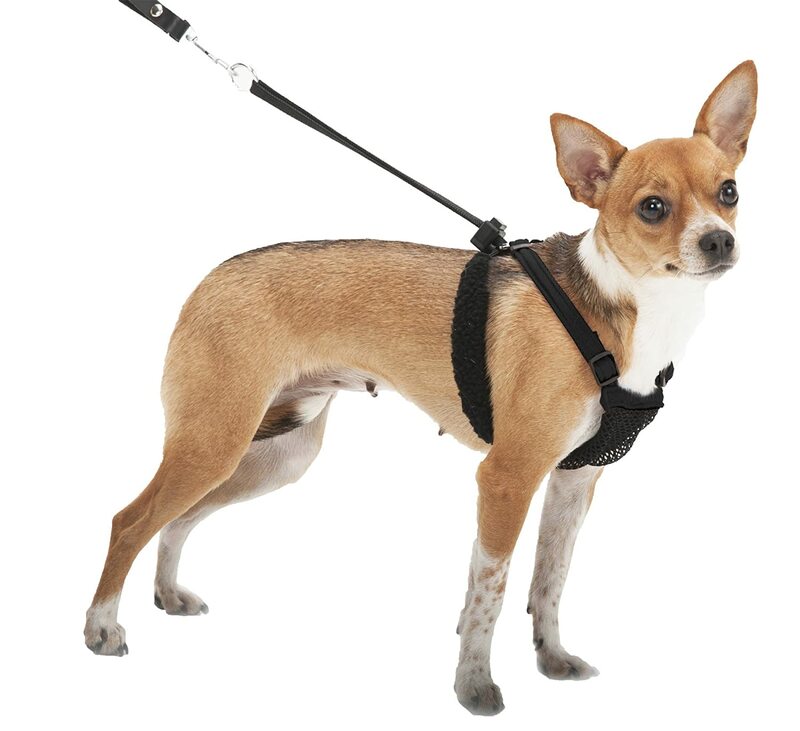 This dog harness measures 8 inches in length is 4.to 4.5 inches wide and is 2 inches in height. It is suitable for use for dogs with a neck girth measurement of 8 to 10 inches and a weight of 2 to 8 inches making it an ideal choice for medium breed dogs like Terriers, Jack Russells, Poodles and similar breeds. 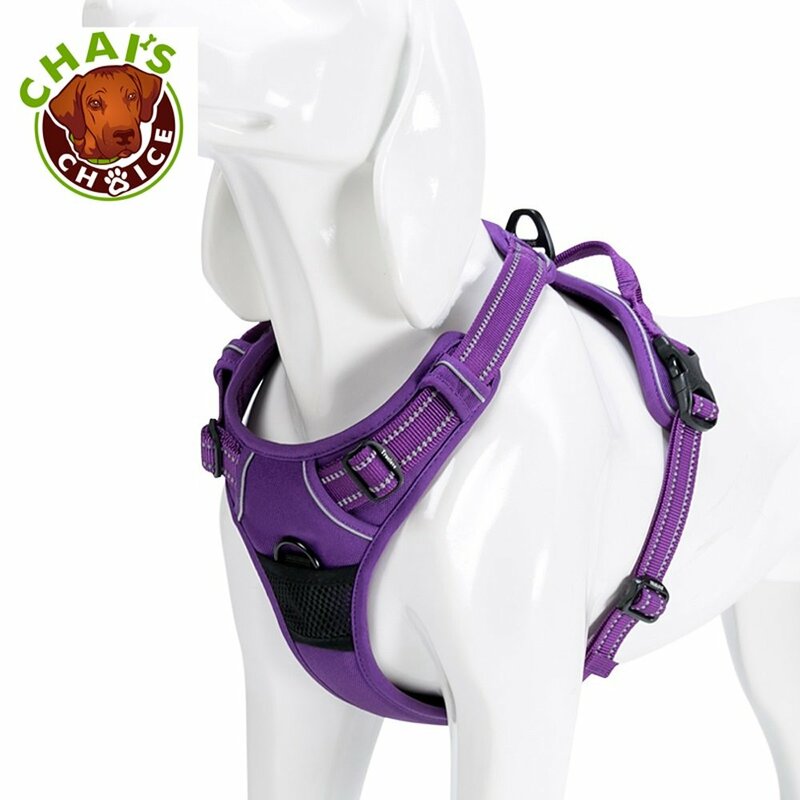 ‘Chai’s Choice dog harness is a lightweight and comfortable harness that is designed to be easy to use and comfortable to wear for your pooch. It is stylish, durable and is designed not o put pressure on your pet’s neck eliminating the risk of injuries and ensuring a comfortable and enjoyable walking experience for your dog. Built to be stylish yet durable, this dog harness is made with scratch resistant oxford material that guarantees long-term usage. It is designed to be lightweight and comes with a Duraflex buckle with effective loading capacity for added tensile strength. It comes with impressive features for added safety while working or riding with your dog. Its Nylon webbing is made from reflective material which improves visibility when using this harness at night. It also has a sturdy handle which you can loop a seat belt through if you have your dog riding with you. An adjustable strap ensures the harness is a snug fit for your pooch. The small size is built for dogs with a neck size of 17-22 inches. Be sure to measure your dog’s chest size and find a matching size from the guidelines provided by the manufacturer. It looks like the leash hook is plastic. My dogs are big and pull hard. Are they sturdy enough to not break? This unique “ombre” American River step in Harness is a patented design from doggies design. 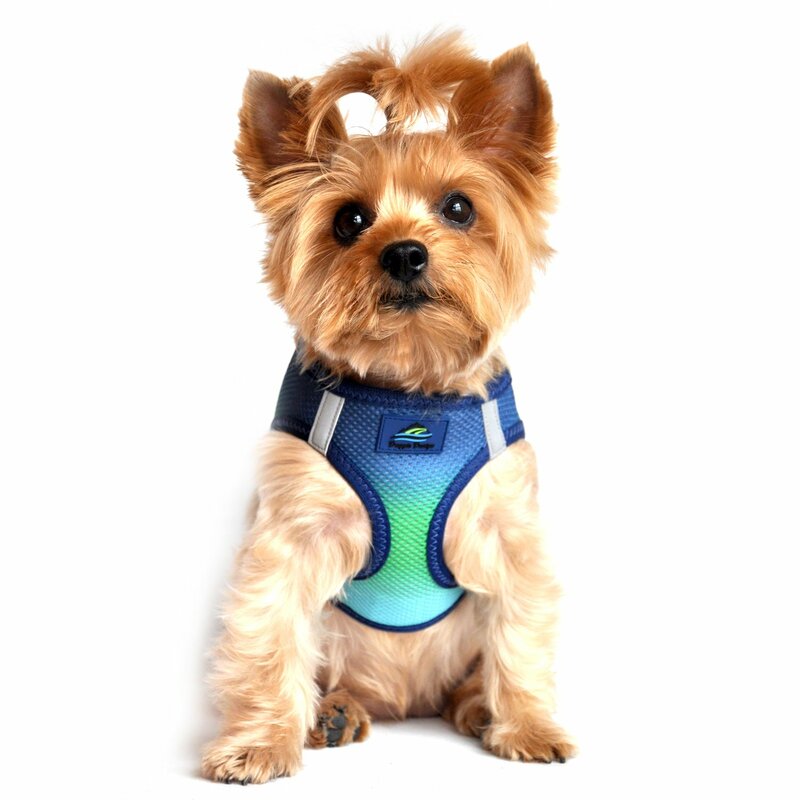 This choke free harness comes in attractive rainbow colours created using a unique colour blending techniques. This Step-in Mesh No Choke Harness has been designed to accommodate small dogs and specially reinforced for larger dog sizes as well. Its XS size is suitable for dogs with a chest width of 9 to 11 inches weighing 2 to 3 lbs but also comes in XXXL sizes which can accommodate large dogs reaching as much as 90lbs comfortably. To find the right size of this harness for your dog, the measurement should be of the chest area behind your dog’s front legs. Ensure that you only purchase a snuggly fitting harness for effectiveness. Does this come with a leash? What type of harness is best for dogs a small dog? Knowing what type of harness that is best for your dog depends on some factors. It is, not a subject of picking a good quality harness since being of high quality alone does not guarantee that the harness will be a good small dog harness for your pet. One of the most important things to consider is your dog’s size. Even small dog breeds come in different sizes, and you have to pick a harness that fits your dog’s size perfectly for it to be effective. Different harnesses have different criteria for measuring dog size usually based on how the harness fits. Some require you to measure the girth of the chest while some measure the base of the neck. Usually, the manufacturer will provide a chart of standards to compare your measurement to ensure you check this to be sure of the right size to pick for your dog. You also have to consider your Dog’s behaviour and temperament. If your dog pulls at the leash a lot when you walk It or has a tendency to jump or lunge, then you have to choose a soft dog harness that allows you greater control yet will not injure your dog when it pulls. Usually, you should look out for a comfortable dog harness that helps to control your dog by gently putting on calming points rather than on the throat to prevent injury. A more docile dog might be able to use any harness, but you should still pay special attention to its safety. Another point to remember when searching for the best harness is to look for one that is durable. This to a large extent depends on the material it is made of. Leather or nylon harnesses are considered the best by many because they are durable, comfortable and do not cost so much with nylon the cheaper options between the two. The material also determines how easy or difficult the harness will be to maintain and clean. Finally, you can consider harnesses with special features depends on specific dog-walking purposes. For example, a harness with reflective colour is recommended if you intend to walk your dog at night. A sturdy and durable built-to purpose harness will also be more suitable as a dog running harness than a regular one. Instructions on how to use a dog harness depend on the type of the harness you are using. Harnesses are of different kinds, and each style has its unique techniques for putting it on. It is important that you get familiar with the different styles to understand how to use it correctly. Typically a harness will either require your pet to step into it or slipping it over its head and have him step through the holes for the arm before your clip him in. For all harness style it is essential that you pick out the right size for your dog as a snug fit will determine the effectiveness of your harness. A good and comfortable dog harness will usually come with adjustable straps which you can easily extend or reduce until a perfect fit is achieved. What is the best leash for a dog? Whether you are using a collar or a dog walking harness, a leash is an important dog walking accessory you must get. However, with so many options to pick from finding the right one might be a bit tricky. There are a lot of things to put into consideration when looking for the best dog leash to buy. Most importantly, the best leash should put into consideration your dog’s safety and the comfort of the person walking the dog. A good quality leash should be sturdy and durable. It should be also comfortable for your dog leaving enough room for movement but also allowing you to pull back your dog without causing injury safely. It should also not put the walker at risk of being burned or any other type of injury when the leash is pulled. It should also allow the walker to use it without getting fatigued and uncomfortable. The best dog leash will put all of these into consideration. Is harness or a collar better? When it comes to walking your dog, dog parents have to choose between a traditional collar or a harness. Recent times has seen an increase in the use of harnesses in place of collars due to growing concerns about dog safety and the possibility of injury. However, while a harness is less likely to cause an injury compared to a collar, your decision to use one should be based solely on this factor, and this doesn’t out-rightly mean that a collar is less safe. It all depends on your dog and the situation of use. Both a harness and a collar have their specific pros and cons. A collar is a great choice when you have a dog that doesn’t find using a harness comfortable. In this case, it isn’t advisable to force and harness on, and it is simply better to use a collar. Many dog parents also find using a collar much more convenient as it is easier to take on and off compared to a harness. However, collars are not ideal for training dogs and are likely to cause injury if pulled incorrectly with the neck, eyes, and thyroid glands being at more at risk of injury. Apart from the fact that not every dog likes the feel of a harness and the possibility of injuries due to incorrect usage and complexity of fitting instructions, there seems to be few cons to using a harness. It is more useful for training your dog, and are recommended for specific breeds such as pugs, bulldogs, terriers, and so on. 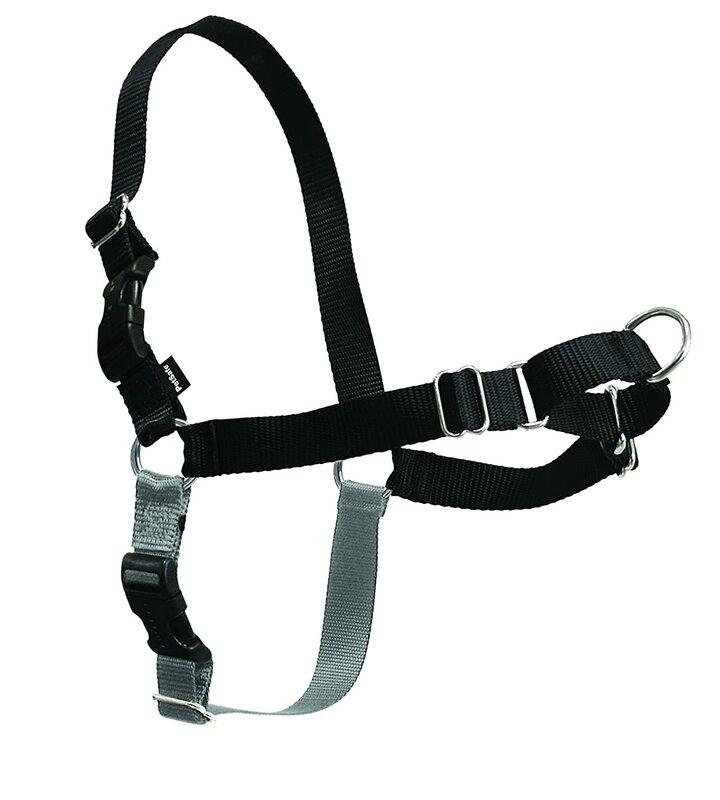 Harnesses also provide better control and are less likely to cause an injury. At the end of the day, the final choice depends to a large extent on your dog. Your decision should put into consideration factors like your dog’s breed, age, level of activity and whether it finds either of the two uncomfortable or not. A dog harness is a piece of accessory which consists of straps that loop around the torso of a dog usually to keep it restrained. A dog-harness is usually fastened together using snap-fit buckles are usually size-adjustable and are made from a variety of material most notable of which is leather or nylon with plastic buckle. Most harnesses have a ring for clipping on a leash to hold the dog.